Read what our clients are saying about us, directly from the Survey Cards they fill out at our facilities. Staff was absolutely incredible! Helpful, flexible, mind and patient. They were a pleasure to work with. They made life easier for us! Thank you very much for another year of outstanding service. All feedback was very positive. Our Event Planner had an opportunity to hear it first hand from some of our distinguished guests. 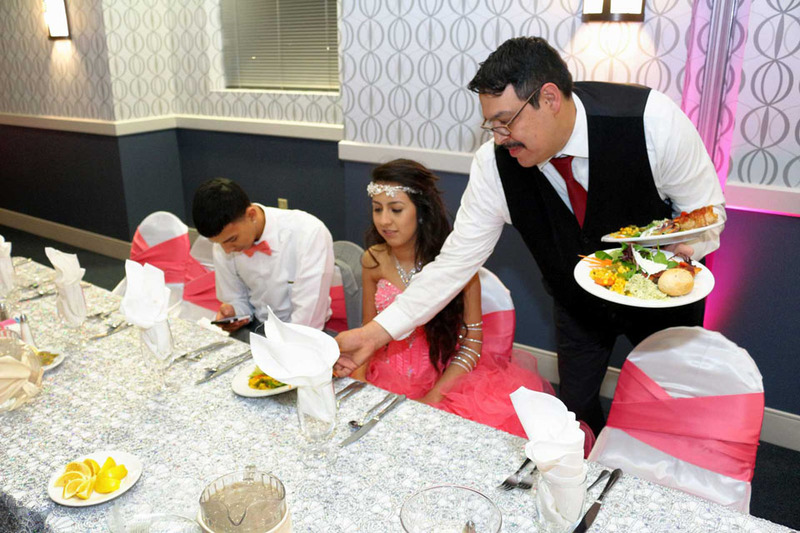 Everyone was impressed with the venue, the service and loved the meal selection. Let me know if there is anything we can do from our end to make things run smother for your staff. The Red Oak Ballroom was the best location for my daughter’s celebration. The location was great and the staff, simply put, exemplary! Karen was professional and caring during the planning phase, handling the multitude of changes with patience. Ehab was amazing, from the helpful decorating hints to the attentiveness that bordered on clairvoyant. Aurtan, Aurtan, AURTAN!!!! I would need more space and a thesaurus to describe how she made my daughter’s night that much more enjoyable! AWESOME. Wow! Where to start. The staff was friendly and willing to help. The atmosphere is very inviting and peaceful. The meeting room met our needs and then some. Thank you for making our event a success! The staff was awesome! The venue is very nice and the location is so convenient. We will definitely come again. Ms. Priscilla did a wonderful job helping us and setting the venue. Our Battalion loved the food and they consider it the best food they’ve had.m when it comes to our military ball. All people who worked at norris Center San Antonio were so friendly and helpful. 5 Stars! We were very impress with everything the service and food were excellent. All our family and friends were highly impress too. Pricilla and Bobby did an excellent job with the event. The attention to the small detail made it. Both very easy to work with and very accommodating to our needs. We highly recommend this venue to everyone. Great job!!! Deborah Lampkin is the GREATEST person to work with on these meetings. We have different types of meetings every other month and she ALWAYS delivers. Make my job so less stressful knowing she is handling all the arrangements at the venue. Thank you so much Deborah!! Deborah, thank you for all your help with the preparations. You were so flexible and patient with us even with the last minute changes to the table setting. It was greatly appreciated to be able to set up the day before. It relieved so much stress so that we could enjoy the day of the celebration. You and all the staff at Norris are a fabulous group. 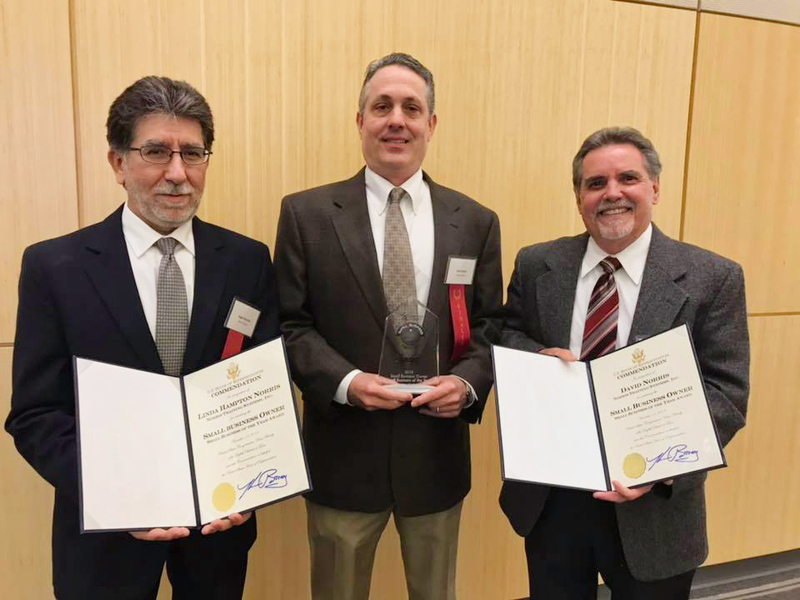 This year, NASA hosted the 33rd annual meeting of the Inter-Agency Space Debris Coordination Committee (IADC) in Houston during the week of March 30, 2015. Almost 150 orbital debris specialists from around the world attended. 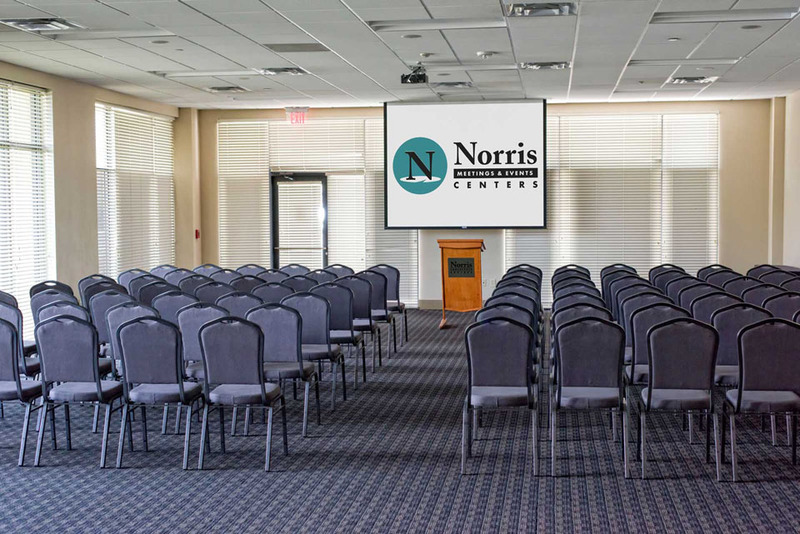 The Norris Conference Center and Texas A&M Mays Business School at CITYCENTRE provided the session and banquet rooms to make this event possible. The IADC is an international governmental forum for the worldwide coordination of activities related to the issues of man-made and natural debris in space. Each year, IADC member agencies meet to exchange information on space debris activities and identify debris mitigation options. Member space agencies, now 13 as of 2015, rotate hosting the annual meeting and CITYCENTRE provided the perfect venue to the IADC this year. NASA would like to formally thank the Norris Conference Centers for your professional service provided to the IADC members during the registration process, opening session, banquet dinner and closing session. Your facilities were ideal for our event and the praise received from our international colleagues throughout the week were numerous. On behalf of NASA and the IADC, thank you again for your exceptional support in making our event a success. Absolutely phenomenal job. Would definitely recommend. Our Coaches said that, of the 25-30 years and all the banquets they have attended in that time, last night’s was by far the best banquet they have ever been to. Everything was spectacular and I cannot thank you enough for everything you and your staff did to accommodate our event. It was a truly spectacular event; and your team was so easy to work with and very accommodating. We appreciate everything you did for us. She was asked if she recommended we come back again:Yes! 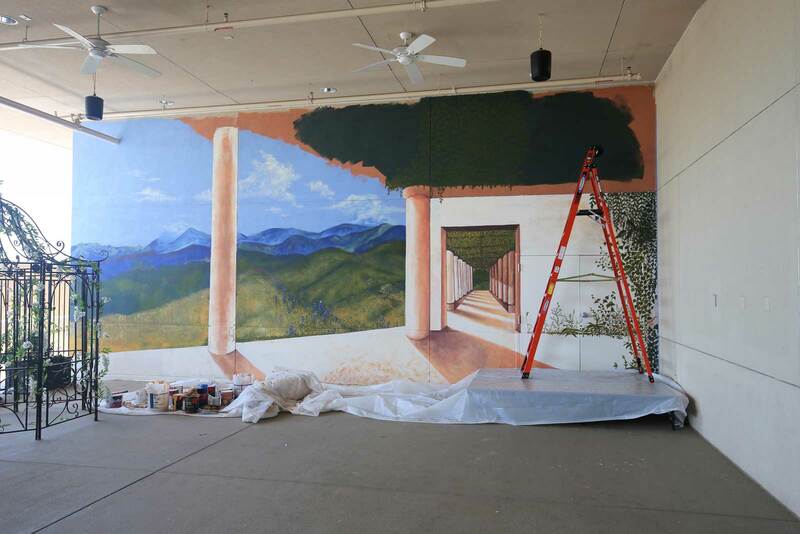 I love working in the Norris Conference Centers. Everything was set perfect upon arrival; classroom seating, double screen, perfect reg area complete with all boxes. The beverage tables were monitored and replenished as needed. Staff were very easy to work with. Lots of restaurants in walking distance. Thank you once again to Deborah Lampkin and Carrie Schilling! The Cypress Falls High School Band would like to thank you and your staff for a wonderful evening. I have had wonderful feed back about the NCC. I attended the banquet as a parent as well as the event coordinator. The food was absolutely amazing, the staff was so courteous and helpful. We couldn’t have asked for a better evening. Thank you once again for a fabulous evening! From the first day arriving to your facility (Fort Worth/undance Square) I was in WOW! What an amazing space for conferences. Manny the manager on duty was one exceptional individual. Any request we had he was on top of it. His ability to stay late and then be there first thing in the morning with a welcoming smile really made an impact on everyone attending. I have attended many training conferences, but this one will leave a lasting impact. 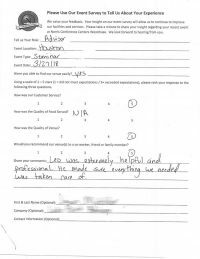 The staff was welcoming, helpful, and went over and beyond with any requests we had. Keep up the great work Manny, Karen, Mary, and all the other individuals who made the event a success! OUTSTANDING service! Your staff made my planning of the meeting, and the actual day of the meeting a breeze! I appreciate it very much. 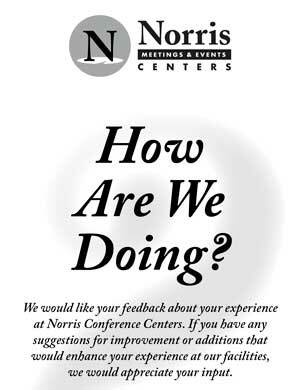 Planning a meeting remotely can be a challenge, but EVERYONE at Norris in San Antonio made my job easy! Flexible and accommodating! !The lounge areas gave the meeting attendees space to gather for personal conversations. I appreciated that the food was left out long enough for people to pick – this was so helpful. I can’t say praise you all enough! Heard all went well yesterday, and everyone appreciated your attention to detail! Thanks for ensuring our event ran smoothly. Guess you are totally acclimated to the new position, and hope you are enjoying it. Lillie, David and Robert were fantastic! 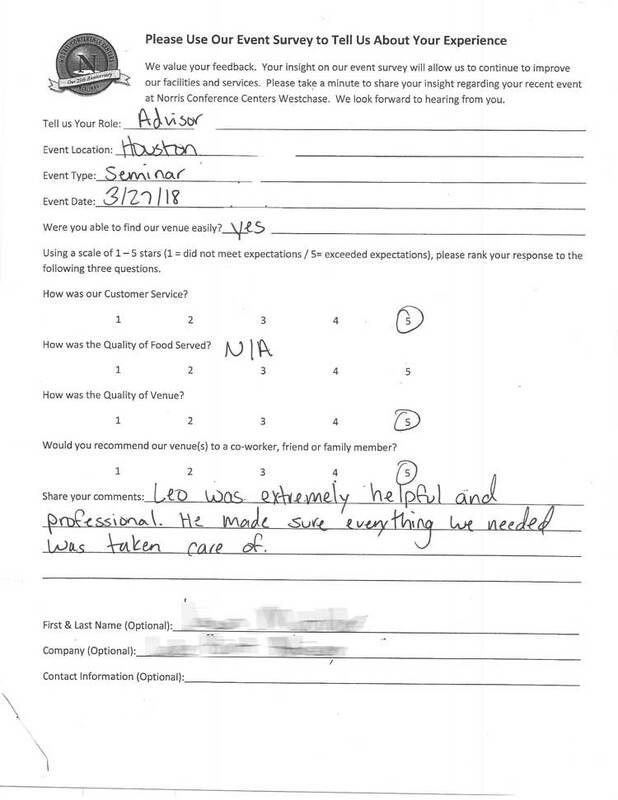 They were very accommodating, friendly, prepared, and a pleasure to work with. As an IBM employee, I will certainly recommend this facility and Lille and David to other Houston IBMers. We had a wonderful experience and a very successful meeting thanks to this team! Everything was top notch. Juan met me right when I walked in. He showed me how to work everything and got what I needed set up. 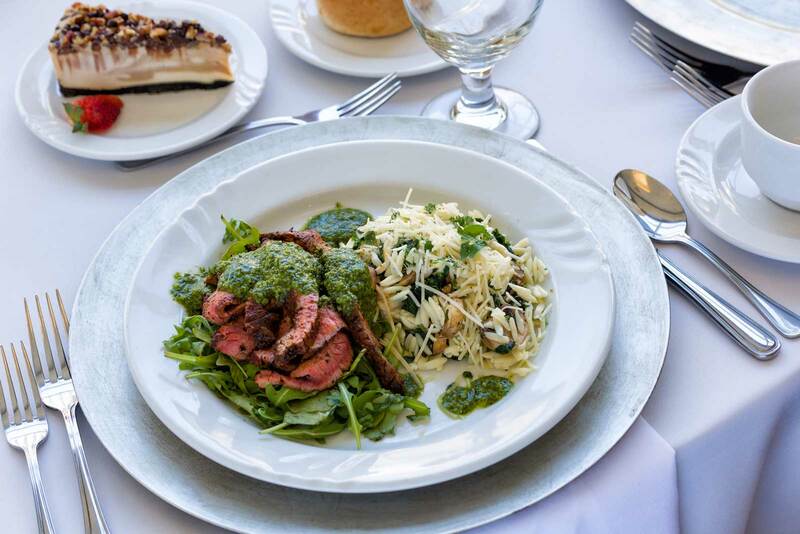 The food was fabulous – some of the best that I have had at trainings.